The Long Road to China: Black and White Wednesday - "Scenes From a Fun Filled Father's Day"
Black and White Wednesday - "Scenes From a Fun Filled Father's Day"
We had a lot of fun celebrating Father's Day with our family. Since the weather was so perfect, we decided to spend the day outdoors and in lieu of an elaborate dinner, we kept things super simple by grilling out! 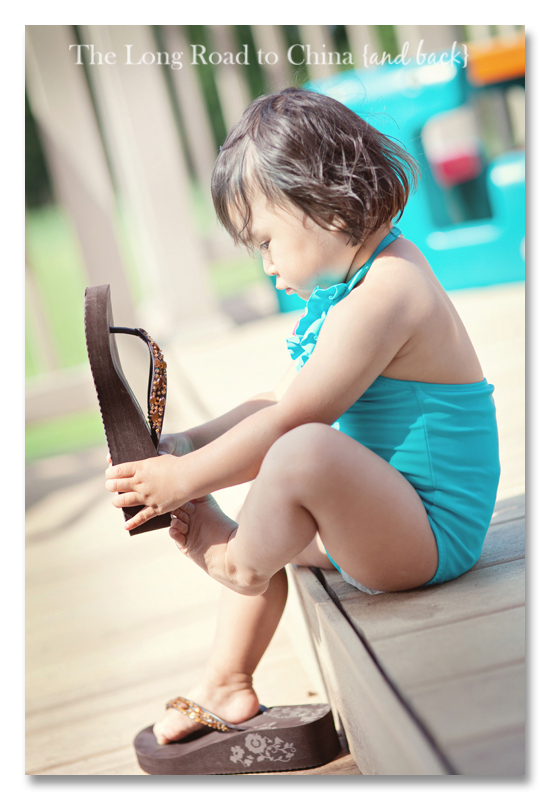 While we were waiting for my parents and my nephews to arrive, Reagan decided she needed to accessorize her pool look with my flip flops...... my shoes are her latest obsession. She LOVES to wear them and she is actually able to walk in them....very well I might add. I love how her toes are clenched in order to keep them on her itty bitty baby feet.........and how about those legs? OH MY....I adore her baby chub. 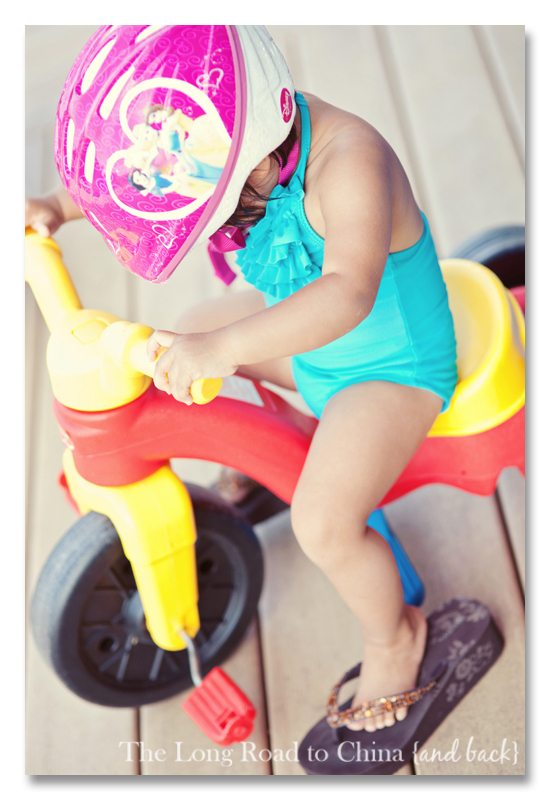 If the flip flops were not enough, she needed to add her sister's princess helmet to complete her look. Seriously, Reagan would not take this helmet off....she was so sweaty yet she would not let us remove it from her head. She has been wearing it for the last three days. I am not kidding.... I walked in the door from work yesterday and she was running around the house with it on her head......LOL! If it is within her sight, she wants to wear it. I wish I would have had my camera...actually, I wished I would have had it on video. She gets so very proud when she gets it on her head and buckled under her chin. SHE WANTS TO DO IT ALL BY HERSELF! It did not take long for the fierce foursome to spring into action...... no doubt the screams could be heard for miles around as water flew in every direction. They eventually took a break from the pool and decided to dry off and get ready for dinner. They shared some "appetizers" while they waited.....and the silliness continued! Sarah is in all her glory when she is in the presence of her two cousins Ashton and Aidan. Coachie gave them a lesson in the art of water balloon filling....and throwing! Things got a little more than wild and everything and everyone WAS COMPLETELY SOAKED. Take a look at who was in control of the hose. He looks so innocent back there with that big smile on his face, but don't let that fool you. He was the instigator and had the four little ones screaming at the top of their lungs.....they LOVED it but as always, we had a few moments where someone was in tears. Can you guess who it was in this picture? Eventually, we put an end to the hose and the water balloons. The deck was getting super slippery and we were afraid that someone was going to get hurt. Besides, the littlest one was starting to get tired. Don't ya just love that picture of her with Pat and Sarah? Such a tender moment between Daddy and his two girls. 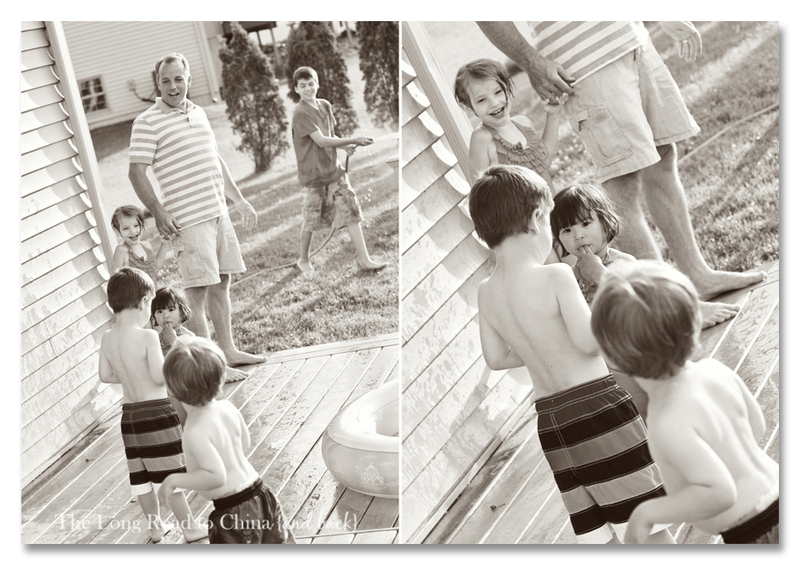 The faces and expressions captured in these photos are priceless to me....and I hope that one day the kids will look back at these pictures and relive all the fun that was had on this Father's Day. 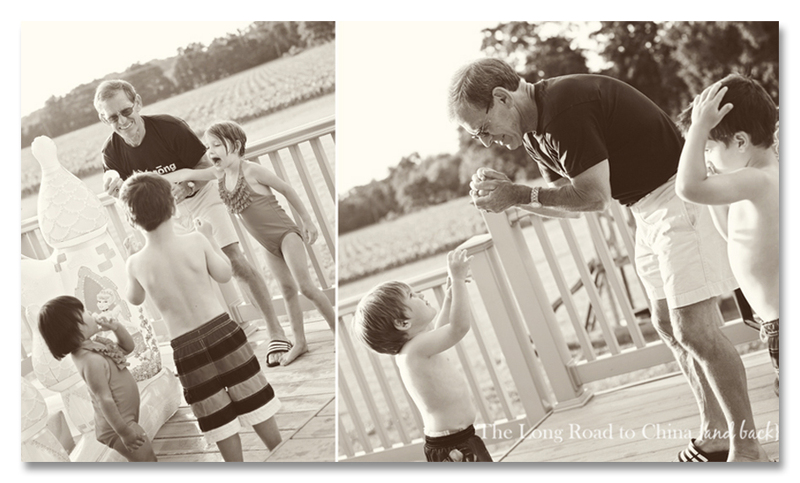 With each year that passes, their Dad/Uncle and Grandfather get older, but they will always remain young at heart! That looks like a great father's day! So glad you could have a fun time with your Dad : ) I LOVE his shirt. That is the coolest. And the girls are so adorable in their bathing suits. I just want to squeeze them. so many happy memories - love it! chubbo baby thighs - nothing is better...well except squishable cheeks :) Not sure why it can't be so cute on me! Great, great post Lisa. I just love all the pictures and stories to go with them. What a perfectly fun day. And yes - those chub thighs are edible. Wish we could keep them tiny forever. You actually sound more relaxed now - I love the feel of this post. July is around the corner - can't wait to get together. Oh my word, those little baby feet and legs are just too much...love it. She somehow reminds me so much of Kerry at that age. Looks like all of the kiddos had a great time and it looks like a nice relaxing day for the big people, too. Beautiful beautiful photos! The one of Sarah comforting Reagan had me a little teary! *sniff! * Looks like such a wonderful time! ♥ Gorgeous, warm b&w's! Of course I am smitten with all things Reagan ... but I must tell you seeing your Dad in that t-shirt and so engagned with his grandchildren was simply beautiful! Fun times! 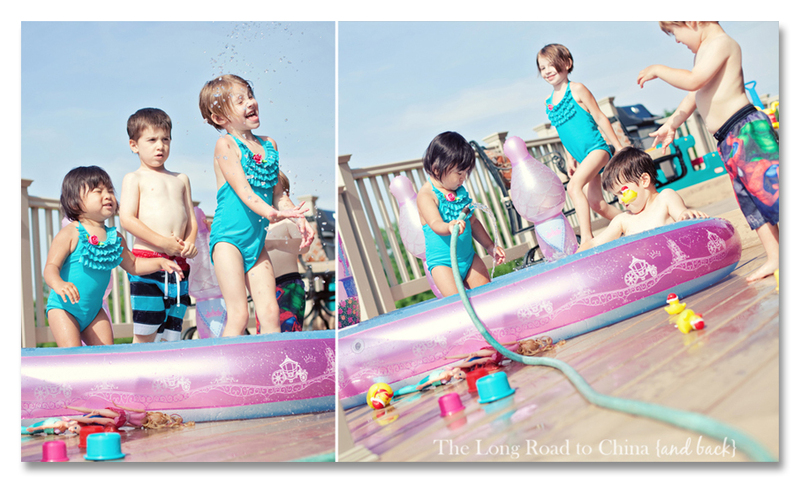 Love each shot...those swimming pool ones are fabulous! Your Reagan and my Jenny should get together and share shoe stories...My girl LURVES my shoes and I have the hardest time getting her to wear her own shoes when it comes time to leave the house! :) Love your dad's shirt! Wonderful pictures! Happy Family Day Everyday! looks like the perfect day. Your Dad looks like a very sweet man. Love the girls bathing suits. And that picture with Dad and girls is precious. i simply adore every photo and the story to go with this post. sarah's hair cut is just precious on her. i know i said that before but really it is perfect for her little face! love the last photo of pat with the girls - so sweet! So sweet -- what a fun Father's Day! Oops, I just put my comment on last week's post. So if read something about ruffled bikinis there be sure to laugh. Hi! This is my first time linking up. I lovee your blog and your amazing photos! I enjoyed reliving your Father's Day with you. What a fun day you had surrounded by your family - lucky you to have so many blessings! Looks like everyone enjoyed themselves, a lot! hope you did too! Tears are nearly inevitable on those days, someone always gets tired or hurt, but i suppose that's part of life, and the tenderness towards Reagan is a sight to behold. Oh my goodness, you take the most ADORABLE pictures! What a perfect fathers day!! We love cookouts with family, something we definately treasure. 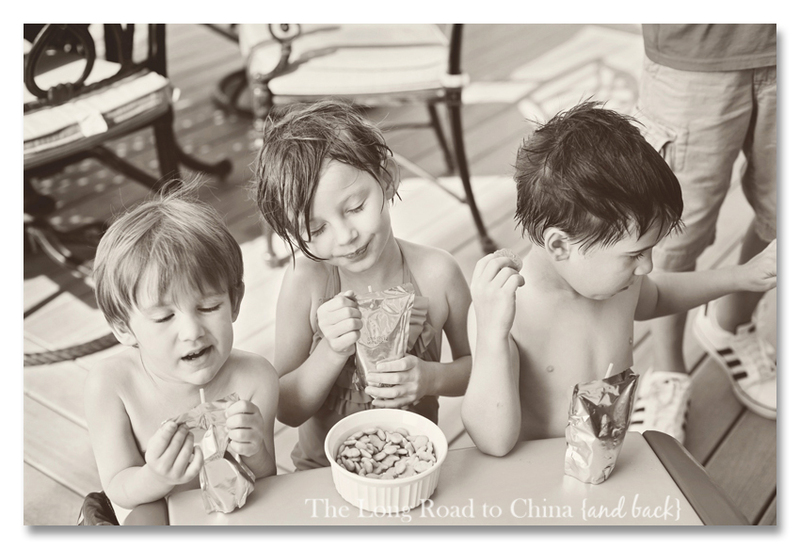 I know your kids will be so thankful when they look back on these pictures, you captured it perfectly! And that baby chub...my favorite!! Both my girls had their fair share of it and I loved it ;) What a beautiful family you have. 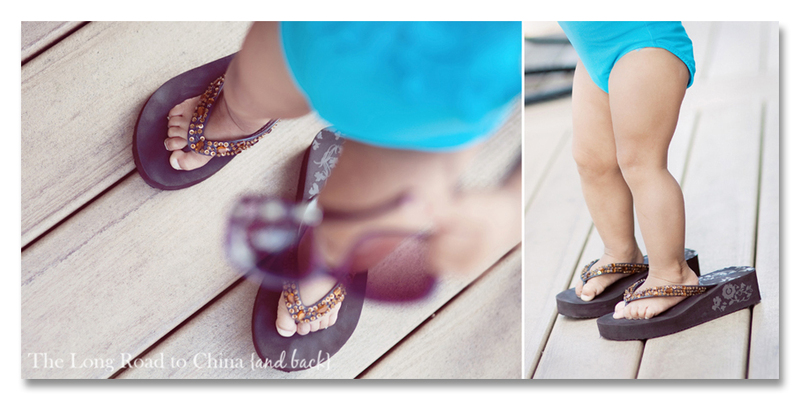 Oh my... her wearing the flip flips is just too cute. That last shot is too perfect. Lovely. It looks like you had a fun, but slippery, Father’s Day! I love, love, love Coachie’s shirt and the picture of Pat and the girls is just precious! 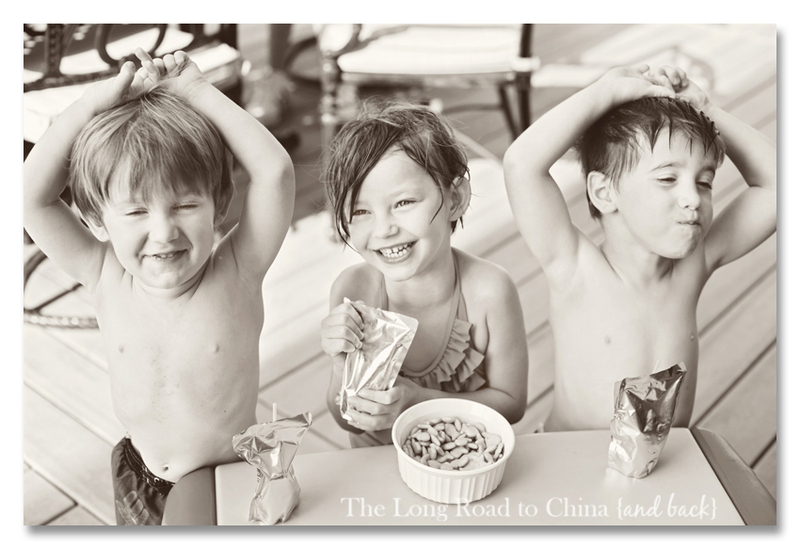 I am also drooling over the matching swimming suits! Happy Hump Day! Hope to chat with you soon! 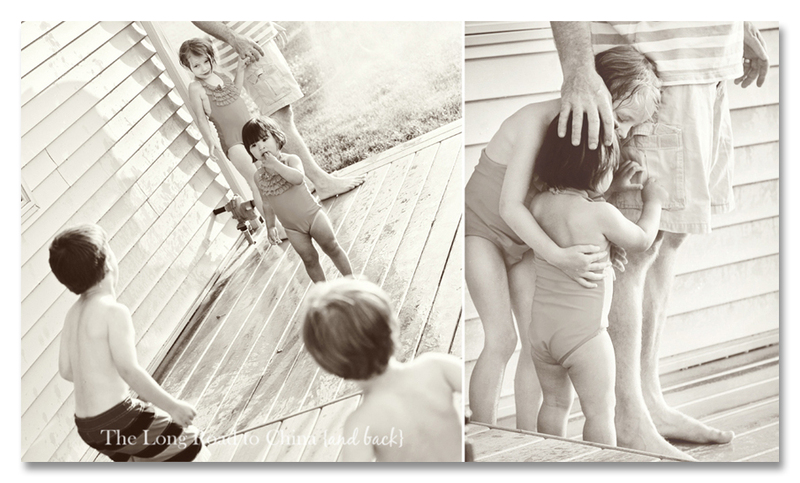 What a beautiful photo shoot of a great day with family! Thanks for sharing!! oh Lisa ... I could just eat Reagen up ... she reminds me so much of when Emma was a baby - those little legs, that little will to do whatever she wants ... oh my my!!! Let me try this again, LOL! Awwwwww, I love all of these!!! The kids look like they were having a blast, and I'm guessing the dads did too. Adore the one of Pat and the girls, so super sweet. Coachie's shirt rocks!! LOL @ Reagan in that helmet, she cracks me up! These are some of my favorite photos you've taken! You've captured the beauty of being a child on a summer's day. Love every aspect. Can definitely tell you all had a fabulous Father's Day. What a beautiful day for SO many reasons~ the biggest being a little one that now has a forever father!!! God is good! Hi there, I'm Ms. Becky and this is my first time participating in Black and White Wednesday. your photos are a dream; you've captured moments with a great eye for joy. thanks for hosting. Wonderful memories! I just love "in the moment" photos like these. Wow! What a wonderful day you had! I love how Reagan wears the flip flops and wants to wear the helmet! SO cute! Have a great week! Oh Lisa what a wonderful day. Great memories recorded beautifully! You have an amazing way of telling a story through your lens. Those little scrunched up toes are so perfect and Lilah has that same big wheeler trike - she loves hers - although I had to drag her off it this summer to get her onto a real bike!! Those daddy pictures just fill the heart and I could tell your little one was worried, just her eyes and those little fingers in her mouth. She has an AMAZING big sister. It shows what an amazing role model you are to Sarah. 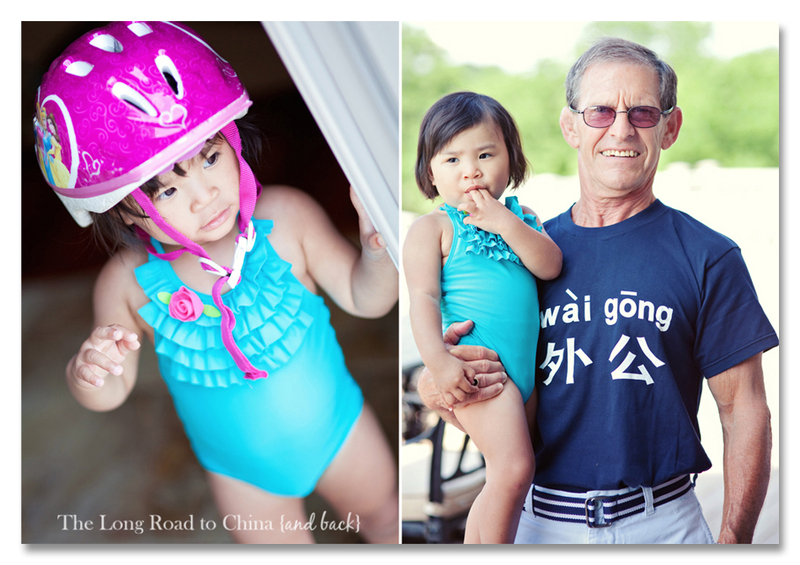 LOVE these shots of Coachie with his Grands....your father is so COOL..and that shirt for his baby grand...perfect! Reags cracks me up and that shot of Nick with the hose...oh, I know he was up to no good. So good to see the Handsome Pat (the lost Kennedy brother) in some shots.....talk about one of the best Daddy's I know! Can't wait to have our clans together again this summer. Black and White Wednesday - "Nothing"
I Heart Faces - "Let's Hear It For The Boys"
Slick Nick - "Sunday Snapshot"
Black and White Wednesday - "Daddy's Girls"
A Pool Fit For A Princess.....or Two!